These little bites are just as satisfying and delicious as an actual munchkin. They are similar to the original donut muffin recipe but with added spices and juicy apples :) They aren't fried so you can feel good about popping these scrumptious morsels! Preheat oven to 375 degrees and grease 24 mini muffin cups. Cream butter and sugar in a large bowl until creamy. Whisk in the milk, then the baking powder, nutmeg, cinnamon and cloves. Add in the flour until well mixed. Gently fold in the small diced apples until well incorporated. Fill muffin tins about half full with mixture. Bake until the tops are lightly golden, about 15 to 20 minutes. While muffins are baking place 1/4 cup melted butter in a bowl. In a separate bowl mix 1/2 cup sugar with the cinnamon. 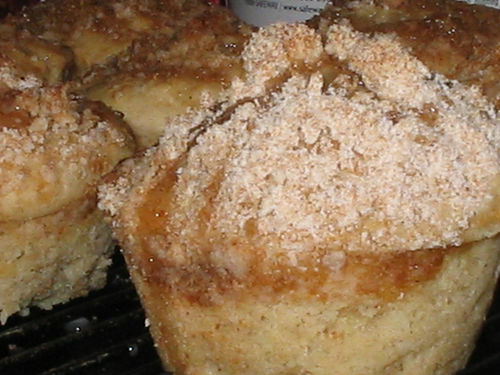 Once muffins have cooled well enough to touch remove from the tin and dip the top of each muffin into the melted butter then into the cinnamon sugar mixture. Enjoy! I made these today.. instead of the cinnamon, nutmeg, and clove, I used a tsp of apple pie spice.. it was a huge hit! Thank you for the recipe! Good n' Plenty Bunny Cookies - Adorable! Zucchini Chips - So Addicting! Make sure to follow us on facebook for daily recipes, and find us on pinterest to view our photo archives. Are you a business owner or blogger looking to gain readers? We have over 200,000 views per month! Contact us today about our low advertising rates to become an affiliate or sponsor. Join our Site to Receive Updates! (c) Six in the Suburbs 2012. Ethereal theme. Powered by Blogger.